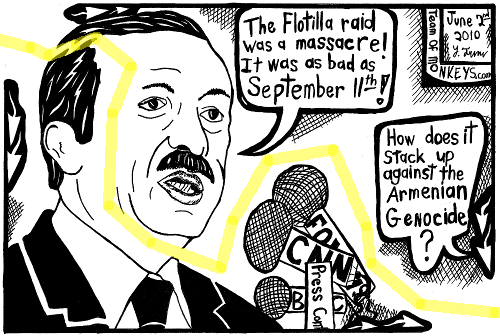 Cartoon maze of Turkish PM Erdogan comparing the flotilla raid to september 11, someone in the crowd asks, "How does it stack up against the Armenian Genocide"
WASHINGTON — Turkey's foreign minister on Tuesday likened Israel's deadly raid on a Gaza-bound aid ship to the 9/11 terrorist attacks, demanded U.S. solidarity and harshly criticized the Obama administration for not issuing a "clear condemnation" of the assault. Denial of the Armenian Genocide is the assertion that the Armenian Genocide did not occur in the manner or to the extent described by scholarship. The Armenian Genocide is widely acknowledged by genocide scholars to have been one of the first modern, systematic genocides, as many Western sources point to the sheer scale of the death toll as evidence for a systematic, organized plan to eliminate the Armenians.